Ugga Bugga Video Slot Guide & Review - Casino Answers! Ugga Bugga is a 3-reel, 10-row, 1-line multispin video slot developed by Playtech, featuring a wild symbol. You can play the Ugga Bugga multispin video slot at Bovada. Coin values on the Ugga Bugga slot machine are $0.01, $0.05, $0.10, $0.25, $0.50, $1, $2 and $5. You can select 1-5 coins per spin by using the “Bet One” button. You can bet as little as $0.10 per spin on the Ugga Bugga dime slot up to the maximum total bet of $250 per spin. Once you select your bet, hit the “Spin” button or “Bet Max” and the first row will spin. You will then be able to choose which of the three reels you want to hold across all of the rows (if any). Hit “Spin” once again to spin the remaining nine rows (or all ten if you don’t hold any reels). The Idol symbol is the highest paying symbol on the Ugga Bugga online slot game. If you hit 3 of these Idol symbols on a maximum spin, you will win Ugga Bugga’s 1000 coin top jackpot. On bets other than the maximum bet, it will only pay out 250 coins. The Idol symbol is wild and will substitute for all other symbols in Ugga Bugga. You can win lots of cash by hitting this jackpot at Bovada! Ugga Bugga is a one-of-a-kind multispin slot. It is the only 10-row multispin slot game around, so if that’s the kind of action you’re looking for, then there’s not much choice other than Ugga Bugga. You can play the Ugga Bugga multispin slot game for real money when you sign up and make a deposit at Bovada! Can players from the United States play Ugga Bugga for real money? 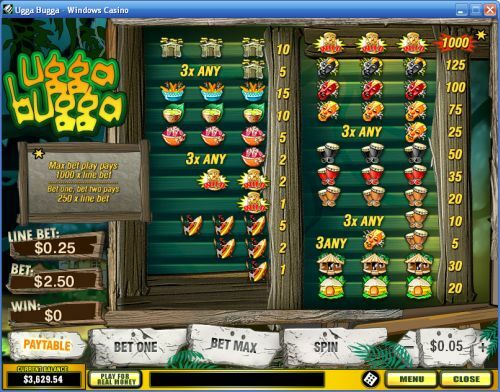 Unfortunately, USA-based players cannot play the Ugga Bugga online slot for real money at this time. For many different alternatives that are USA-friendly, we recommend you visit Bovada. Where can I play a Flash game of the Ugga Bugga slot for free in my browser? You can play an Instant Play version of the Ugga Bugga video slot using Flash at Bovada. You can play for free or you can play for real money. 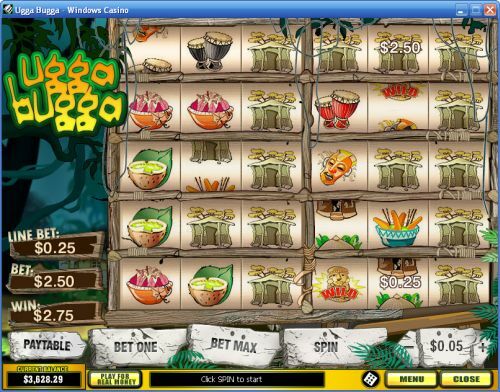 This is also the best way for Macintosh and non-Windows slots players to play the Ugga Bugga slot game. If you experience any problems or difficulties with the Flash Instant Play slot game, make sure you have the latest version of Adobe Flash Player downloaded and installed on your computer.